A man who used the nickname of Al Pacino's character in Scarface has been found guilty of his fifth murder. Mane Driza - also known as Tony Montana - murdered Stefan Bledar Mone at a flat in north London in June 1999. Father-to-be Mr Mone was left with 120 injuries following a "brutal and merciless" attack. Driza, 41, then went on a three-year killing spree across Europe. He was found guilty of murder at the Old Bailey on Wednesday. Mr Mone was murdered by his flatmate Driza over a row about a wedding ring. Driza, then 21, told workmates in Watford he would kill the fellow Albanian, even asking one of them to take him to buy a knife, jurors were told. The prosecution said a lock knife, pick axe and cheese knife and were used in the killing. Mr Mone's girlfriend, Zoe Blay, was confronted by a "horrific scene" when she found his body the next day and was only able to identify him by a distinctive belt buckle. 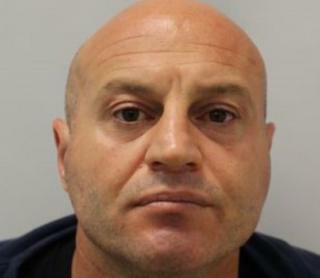 The murder came two years after Driza, who also used the name Sokol Drenova, shot a father and son dead in his home village in Albania and fled to Britain under an assumed name. He arrived in August 1997, claiming to be a 17-year-old fleeing from Kosovo. After killing Mr Mone - his third victim - he fled to Italy, where he shot and killed two men at a bar in Catania, Sicily, six months later. He tried to kill a third man in the bar but his gun jammed, jurors heard. "He travelled to Wembley with murder in his heart and when he found Stefan, he killed him in a way that was brutal and merciless," said prosecutor Tim Cray. In 2001, in Albania, Driza was convicted in his absence of two charges of "premeditated murder in complicity of citizens", along with his father.